Heffy friends! 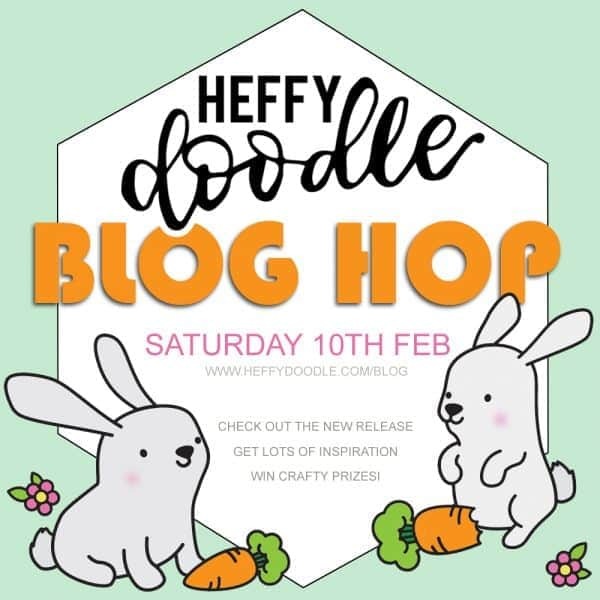 Today is the day, the official Heffy Doodle Blog Hop! We are celebrating the newest release with our amazing design team, plus a couple of super-talented guest designers. This is the official start of the hop, so please be sure to hop along each blog. A random winner will be selected for a £25 gift certificate + free shipping to the Heffy Doodle store. To be eligible, leave comments across the entire blog hop by 11:59 PM PST on 2/15/2018. Winners will be announced on the here. All those examples of the new release are so cute, love how all have as much thought gone into backgrounds as foregrounds. Can’t wait to get my hands on these stampts. I love this idea. I have never heard of a blog hop until recently but I loved this one as the release 3 and all the others are just my style. I have been shopping now that I have seen all the great projects in the blog hop – now just have to wait for the postman to arrive lol. What fun projects and great inspiration on the hop! Love your sweet new goodies and I especially love the fabulously fun and unique Heffy Doodle puns!! Love all the sweet little stamps and dies of his release! Some of the puns are hysterical!!! So excited about the hop! Can’t wait to see what all the talented ladies created.. I love a good blog hop!!!! Looking forward to the hop! I see a lot of familiar names and am excited to see their creations, and several names on the hop list that are new to me. I am anxious to visit their blogs and see their makes too! Off to check them all out! Yay, I love blog hops, thanks so much for organising so much fun for us! I absolutely adore that bunny stamp set – that’s what would be going to my cart for sure, should I win 😉 Thanks for the chance! Getting started on the hop. Excited to see new releases. I love Heffy Doodle! I participated in the Kickstarter program and I was hooked. Thanks for the blog hop. Loving the die cut words from this release. Yay more puns! Oh My Goodness the bunnies!!!! You knew I was going to love the bunnies!! Looking forward to seeing some really cute cards and great creativity on this hop. Looking forward to participating in the blog hop! I love the Little Sqeak Heart set. Yay! I can’t wait to see all the great designs! Very cute release and I enjoyed the blog hop. Can’t wait to see the inspiring ideas. I am on Olga Moss’ page but can not leave a comment. I have tried clicking the different buttons but they are not in English which is fine but I can’t figure it out. I have finished all the others. Awesome release. I had great fun hopping the blogs and seeing so many great designs. Love this new Heffy doodle release! I have actually purchased most of it but do want to complete my collection for sure. Thanks for having a blog hop for inspiration. Love those cute bunnies and carrots and I love blog hops. This is a great new release! I love seeing all the projects! New to this site! I’ll be checking it out and expect to place an order soon! Congrats on your beautiful release!!! I love new releases! Off to hop now for new ideas and inspiration! I’m back from the hop and it was a really cool one ! That’s a great new release, love everything I saw !